Do you want to know whether you can liquidate your company if you have received an application to liquidate notice or wind up order? The answer is yes, you can, but you will need to act quickly. Your company will almost certainly already be in the winding up process, and the Companies Act only gives shareholders ten business days to make this decision. 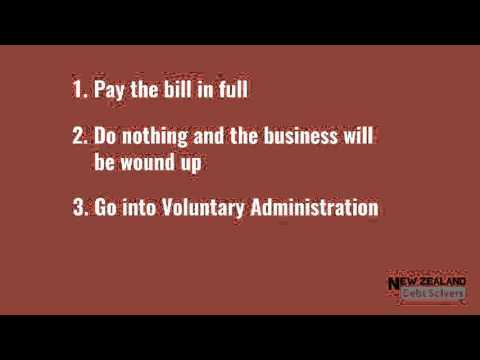 You will then need to either pay the bill in full, which if you are struggling financially will probably not be able to do, do nothing and your business will wind up, go into voluntary administration, or liquidate the company voluntarily. The last option is usually the best way forward, giving you some control during the liquidation process. Debt Solvers has helped many New Zealand businesses through liquidation and given them the specialist advice they need during this often stressful time. Our liquidators are all registered and highly experienced, and our low-cost service is completely confidential. Give us a call to discuss your options today.